This much can be said for French director Franck Khalfoun’s grainy, grimy, LA-set remake of the 1980 B-movie regarded as a classic in genre circles: at least it gives you fair warning. The agonisingly deliberate opening, in which a pretty young clubber is followed home and slaughtered in the hallway by an unseen mouth-breathing predator, acts as a litmus test for the entire exercise – which amounts to a parade of similar rat-in-a-trap carvings. If you’re not driven to the walkout point by the time the first victim falls to the ground, you may get something out of this boringly bloody slasher. Its inconsistent distinguishing gimmick is that it’s shot from the killer’s point of view. 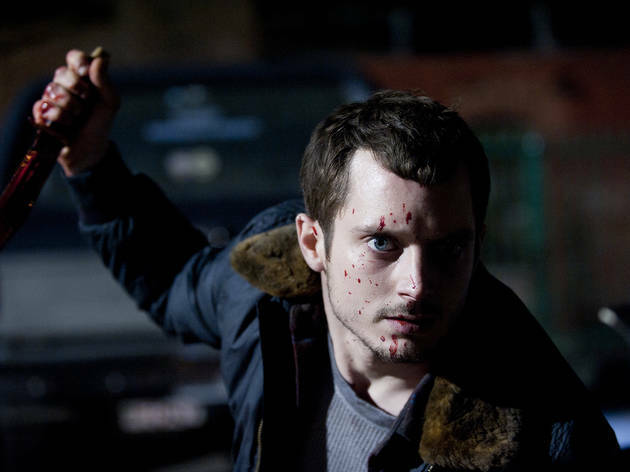 The killer is played by still-baby-faced Elijah Wood and is a tortured collector of shop mannequins, which he charmingly accessorises with the scalps of his prey. The casting feels like a gimmick, too – Wood is about as frightening as Frodo. Terror or suspense, however, aren’t the point so much as seedy discomfort: Khalfoun’s set pieces rarely afford the victims any possibility of escape, and you needn’t have seen the original to know some severe mummy issues lie behind it all. Rank even on its own terms, it’s the kind of inferior remake that also invites questions about the original’s cult status. I absolutely agree. The review is an example of a hanging jury by snobbism, and the remake is a justified improvement on a not particularly good original. An excellent soundtrack, fine acting and special effects and excellent photography and set design mean I'm giving this four stars. It's a quese-inducing experience, but it's good that the gore is not allowed to be mere window-dressing. The quality of this film was a big suprise, because I hadn't expected much.